The Sparkbooth 3.4.17 update adds Evernote as an upload option. Connect your Evernote account to Sparkbooth, and photos will be added to your Evernote notebook as notes. The best thing is you can share your notebook online, so your guests and friends can view the photos. The Sparkbooth 3.4.14 update provides a workaround for the distorted video issue on Macs with Adobe AIR 3.2 and 3.3. It is still recommended to use Adobe AIR 3.1 on Macs for better video. Removed F key shortcut for toggling fullscreen mode. Please use F7 instead. Fix Facebook uploader prompted sign in on start up. Facebook recently removed offline permissions which caused this issue. 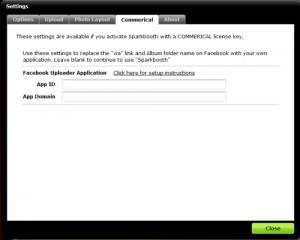 Remove apps from Facebook uploader. Facebook no longer allows photo uploads to an app, please use an app page instead. Fix hidden mouse cursor in Guest Chooser Uploader. If guest presses either Facebook, Twitter, or Email, the mouse cursor remains hidden on the next screen. Default Camera setting is no longer turned on by default for Macs. Please update to Adobe AIR 3.1 to enable multi-webcam selection. Do not update to Adobe AIR 3.2, because of video distortion issue. 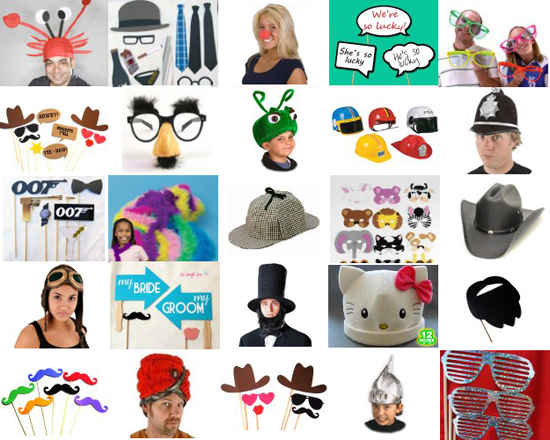 Looking for the perfect prop to add excitement to your photo booth experience? Check out this selection of party props. Your guests will be sure to enjoy them! On Mac, a notification will be displayed if you have Adobe AIR 3.2 or later installed. This will result in the stretched webcam video. The commercial version of Sparkbooth is almost ready for testing. This version of Sparkbooth will have additional features that are useful for commercial user. To start, you will be able to enter a custom Facebook app id, so the name and url on "via" share links can be customized for the Facebook and Guest Facebook uploaders. The default album name will also be changed to your custom name. Later updates will include customization of Twitter upload links, and other useful features. If you are interesting in testing and providing feedback for this new version of Sparkbooth, please click the Sign Up. This beta is only open to existing Sparkbooth customers, so please sign up using your license key email. Sign up for this beta has closed. Correction: Originally it was reported to be April 17th, the correct date is April 19th. You will be unable to purchase Sparkbooth on April 19th, 2012 from 9:00pm to 11:00pm PST, since PayPal will be down for maintenance during that time. This will not affect activations or trial of Sparkbooth.